In our day-to-day work, we have to track many projects at a time. The often used tool on the Mac that we use is OmniPlan. While it is planned for the iPad, OmniGroup has yet to release it. 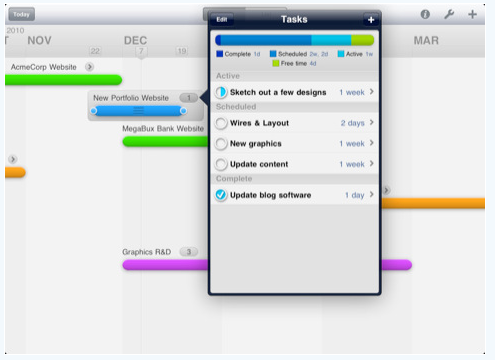 Till that day comes, we are keeping our eyes open for a colorful gantt chart option for the iPad. There are plenty of project planning and task manager tools for the iPad. One we have been using that is very good for some project types is Timeli. An app that just came out at the beginning of January, it is designed to work only on the iPad. Timeli is an app that you would choose for quick project layout to get an idea on how long things will actually take. It is even perfect at tracking smaller projects, but without being able to link for predecessors, in it’s current state, a change might not be reflected downstream. What is does do very well is lets you lay out visually all of the parts of a project. You can create timeline items that can contain sub work items. The finest level of detail is one day, which is fine for most projects that are not emergency fixes. Timeli supports two finger zoom in/out, swipe to move across timeline, color coding and drag/drop of the actual tasks. Since there is no sharing capabilities beyond taking a screen shot of the plan (no import/export currently supported), Timeli is best suited for personal use. Personal use could be at the office or home, but not across teams where you need to have input or changes outsdie of your own. We look forward to a few more features for the app like smaller time lengths, linking of project items and sharing with other iPad users even if it doesn’t sync across those units. It wont take much to make this app a must have in our iPad tools set, for now it does make getting our heads around the scale of a project quicker.